If there’s one thing we believe, it’s that your smile should reflect the real you. The charming, happy, enthusiastic inner-self that you love to let shine. 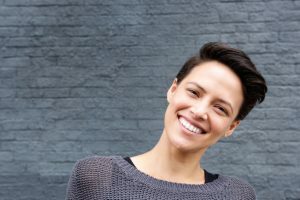 Imperfect front teeth can affect the impression you make, but cosmetic dentistry corrects these flaws to give you a smile you won’t ever want to hide. Let your best self come through — visit your cosmetic dentist in Boston! Boston patients have relied on Drs. Schrott, Dr. Kraft and their associates for high-quality, high-end services in cosmetic dentistry since 1972. Today, we are pleased to offer a full range of aesthetic treatments. Which one would your smile benefit from most? Wafer-thin coverings made of dental porcelain, veneers remake the size, shape, color, and overall appearance of the teeth that show when you smile. Porcelain is highly resistant to stains, so your veneers will stay the same beautiful shade of white for years after their application. Completed in two to three visits to the dentist’s office, veneers provide a dramatic smile make-over. White composite restorations provide a natural-looking solution for filling the cavity left by tooth decay. Compared to silver, or amalgam fillings, tooth colored fillings blend beautifully with the surrounding tooth enamel, require less removal of healthy tooth structure, and can last as long as their silver counterparts. The same composite restoration can also rebuild chipped, broken, slightly gapped, or minorly flawed front teeth. Clear braces allow adults and older teens to enjoy the benefits of straight teeth without having to endure two or more years wearing metal brackets and wires. The customized Invisalign treatment uses a series of plastic aligners to gradually shift teeth into their proper position. Removable aligners allow you to keep eating, brushing, and flossing just like you’re used to. Over-the-counter white strips and other one-size-fits-all whitening options just don’t reveal the whitest teeth. Invest wisely — choose professional teeth whitening for the most stunning results. With in-office and at-home treatments available, you can whiten at the pace you are comfortable with. And customized touch-up kits help you enjoy your results for longer. If you have a damaged or severely decayed tooth in the front of your smile, we can restore its strength and beauty with a natural-looking dental crown. Completed in two to three visits to Kraft & Schrott Dental Associates, the dental crown repairs your tooth without taking away from the appearance of your smile. If your flawed teeth require a comprehensive approach, a smile makeover may be the solution. This approach combines any of the previous treatments, as well as services in restorative and prosthetic dentistry as needed. Your dentist will consider your smile needs and put together a treatment plan suited just for you. Is It Time for Cosmetic Dentistry? As your dentist in Boston, we would love to help you enjoy a smile that looks as healthy and beautiful as it feels. Please don’t wait to learn how cosmetic dentistry can fix your imperfect teeth and help you smile with full confidence once again. Request your appointment today!